For the shortest month of the year, February has been packed FULL of new adventures for PTMSC. The AmeriCorps started the month off by training for Free Science Classes and shortly after began teaching. Eleven 4th and 5th grade classes have already been taught with about 20 more to go in March! We had a great turn out for our Annual Meeting that was accompanied by a climate change lecture. Additionally, for our visitors the Natural History Exhibit had “make your own spa treatment” activity that was a huge success! ﻿﻿﻿﻿﻿﻿I sometimes forget that not everyone heads to the beach at low tide to explore and learn about our marine environment. Additionally, I forget how spoiled I am to work at a place that allows me to hand feed a Giant Pacific Octopus and put together a gray whale skeleton. Not everyone does that at work?? As I slowly walked over the wet slippery rocks and looked around I couldn’t help but think to myself how our touch tanks are way more exciting than this-we hadn’t found anything yet! I was worried everyone was going to wonder why we dragged them out in the dark on a cold winter’s night. Reality Check #1: There is never nothing going on--especially in the tidal zones of the Pacific Northwest! Taking pictures of their new discovery. A hermit crab though? Really? Don’t get me wrong, those little guys are awesome, but there has to be something cooler than that out here! The more we all looked around this one little hermit crab the more we found. All the sudden we found not just one hermit crab, but 4, 5, 6…10! within one square foot of each other. 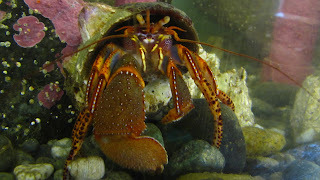 With over 20 different hermit crab species that could call North Beach home; the various sizes, colors, and shapes makes every hermit crab an exciting, and some how always comical, discovery. Reality Check#2: Nature never replicates-individuals of every species are unique. ﻿﻿﻿﻿﻿The night continued to surprise me. 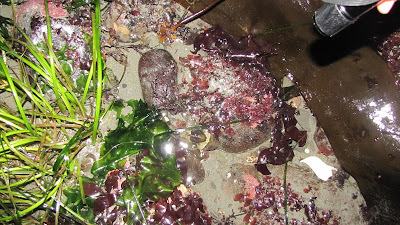 We continued to find more invertebrates, crazy looking rocks, and a rainbow of seaweeds. Then the sky opened to reveal one of the clearest starry nights we have had all winter. We all had to keep reminding each other to stop walking before we looked up or someone was going to get hurt! Auspicious is the best way to describe it--one moment you are looking down at vibrant colored shrimps, nudibranchs, chitons, sponges, and sea stars while you absorb this unknown world below your feet. The next moment you are looking up at the actual stars sparkling in the night sky, identifying planets with strangers and realizing how insignificant we are in this enormous universe. Reality Check #3: Life is a mystery; don’t waste time trying to figure it out--just enjoy the moment. The life below our feet. ﻿Oh, and did I mention we found an Octopus? Make that TWO Octopuses actually! 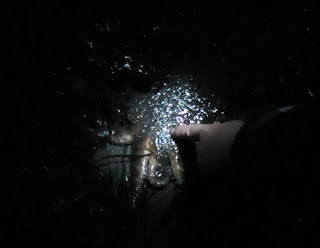 Both were Giant Pacific Octopuses and were highly tolerable of our curiosity as we shined lights, moved rocks, and those who were brave enough reached their hands into the den to feel their suction cups! Everyone gathered around as we explained the life of our beloved GPO’s. Suddenly one of its eight tentacles reached out to see if we were still around! We all oohed, awed and laughed until one of our volunteers stops and says “Guys we have to remember this moment for the rest of our lives!” No words were spoken amongst total strangers, and none were needed—she was right. With giant grins on all our faces we knew that this moment will forever keep us connected, not just through shared memories, but also through our love for the marine environment. Reality Check #4: There is no better. My experiences will never be better, same way they’ll never be less than anyone else’s. ﻿﻿The sad reality of the night was recognizing that majority of people living less than a mile from the shoreline have never explored at low tide, especially a low tide at night! That night I set out on a mission—I will invite as many people as possible and have them join us for another low tide walk at night! The date was set: February 7th with a -1.3ft tide at about 7:40pm. Thanks to our friends at Jefferson County Parks and Recreation we were able to have the walk at North Beach. Everything came together perfectly! There was no telling how many people (if any) would show up, but we did our best to spread the word and we were all pretty hopeful. So when 40 enthusiastic people from the ages of 3 to 75 showed up equipped with flash lights and rubber boots, it might be an understatement to say I was a little bit enamored! We prepped everyone on safety for them and the animals then broke off in two different directions down the beach. The two different groups found completely different creatures and they were only 50yrds from each other! Every person I talked to learned something new and/or saw something they had never seen before! Each person expressed their gratitude for putting on the event and all asked when the next one would happen. Reality Check #5: Nature is the ultimate tool—both teacher and classroom. 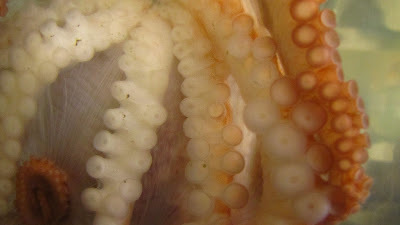 about the hydraulic system of a sea star. New best friend with a sea star! Make Your Own Spa Treatments!